Northern Europe leads the way when it comes to entrepreneurship and innovation. When you think of the word ‘entrepreneur’, you might conjure up a maverick who turned a great idea into a successful business. 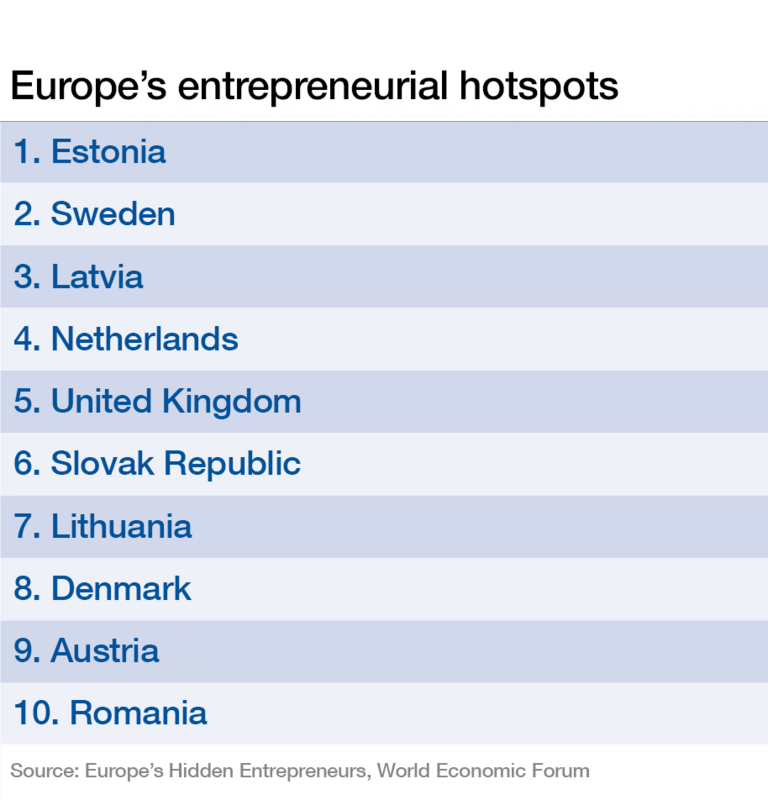 But you’re unlikely to imagine furious entrepreneurial activity in the small European country of Estonia. Yet, according to a World Economic Forum report, Northern Europe and the Baltics are a hotbed of entrepreneurial activity. The report, Europe’s Hidden Entrepreneurs: Entrepreneurial Employee Activity and Competitiveness in Europe, looked at a form of entrepreneurship beyond the typical start-up – intrapreneurship – with some interesting conclusions. Intrapreneurship involves workers formulating and implementing new ideas within organizations, rather than starting their own businesses. In the report these are called EEAs, which stands for entrepreneurial employee activity. Entrepreneurial individuals in Europe frequently choose to start new ventures or projects while working for their employers rather than start their own business, the report found. The report compares entrepreneurial activity within organizations with start-ups, which are referred to as “total early-stage entrepreneurial activity” or TEA. When you look at TEA only, shown in dark blue on this chart, Europe doesn’t do very well compared to other major economies and regions. However, when you add EEA into the mix, Europe comes after only the US, Canada and Australia. In Europe, a greater proportion of entrepreneurship is expressed as EEA than anywhere else in the world: 40% of entrepreneurial individuals are EEA entrepreneurs, compared with 29% in the United States. Looking deeper, it’s clear that countries in Northern Europe are leading the way when it comes to intrapreneurship. For Denmark and Sweden, the majority of entrepreneurial activity is in EEA. At an EEA rate of approximately 9%, Denmark and Sweden’s rate is 2.5% above the third-ranked economy, the United Kingdom, which has an EEA rate of 6.5%. When you take both TEA and EEA together, a picture emerges of highly entrepreneurial Baltic countries. In this ranking Estonia comes out on top, while two of Europe’s largest economies, Germany and France, don’t even make the top 10. Estonia has a high rate of TEA and an above average rate of EEA. Almost 80% of businesses started in Estonia are opportunity-driven and Estonia is often cited as a model for entrepreneurially-oriented policy, says the report. Next is Sweden, which we have already seen has a high level of EEA. In third place is Latvia. Although placed in 23rd place for TEA, Latvia comes first for levels of EEA, giving it its third place on the overall ranking. Italy is at the bottom of the ranking, with virtually no entrepreneurial employee activity to report at all, alongside Greece and Spain. Two unique data sets were combined for this study: the World Economic Forum’s Global Competitiveness Index data, which ranks economies on their economic competitiveness, and GEM’s (Global Entrepreneurship Monitor) assessment of entrepreneurial activity. Entrepreneurship is a key driver of the Fourth Industrial Revolution and the reason the World Economic Forum and the (GEM) have partnered to explore it within one of the world’s crucial economic engines. Fostering entrepreneurship pays dividends across sectors and allows new ideas, models and energy to invigorate the entire international economic system, says the report.